I'm sorry for sharing this heart wrenching story, but I felt this needed to brought to everyone's attention. But when Ayden’s condition didn’t go away, the family took him back to the doctor on July 15. He was finally given a blood test and was immediately admitted to Miller Children’s Hospital in Long Beach with a condition called Biliary Atresia, where the bile his liver produces was not moving to the small intestine. Ayden had surgery July 21, which was declared a success. But within a few days he was taken by ambulance to the Childrens Hospital Los Angeles with liver failure. It was then that the search for a donor began. As many of you know, an awesome thing about transplants and humans in general is our capability to donate living partial livers. Both livers will grow to be fully working and vital livers. So the search began for a match. Esquivel’s boyfriend and Ayden’s father Tommy Groomes is 18, however his blood type is A-, little Ayden needed O+ or O-. What about Krystal? There was nothing she could do. Not because she’s unwilling — she’d give anything for her son, let alone a small piece of her own liver. And not because she’s unhealthy or her blood type doesn’t match Ayden’s — they’re actually a perfect match. All that stands in the way of Esquivel saving her son’s life is a birthday and a parenthetical policy adopted by Medi-Cal. Esquivel will become an “adult” in March. Without using insurance, the cost of the transplant surgery would be astronomical — so high that the hospital, home to Ayden for the last month, won’t even hazard a guess. “I just can’t bear that insurance is the reason we can’t save this baby,” said Esquivel’s grandmother, Nancy Works of Apple Valley. With her granddaughter ineligible, Works has joined with other family members and friends in the struggle to find a donor for Ayden. So what happened? Ayden was placed on the waiting list, with approximately 16,000 other people waiting for livers. On top of that Ayden was an infant, meaning the donor needed to be a child or another partial donor. After a front-page story in the Daily Press on the search for a donor, dozens of Victor Valley residents contacted the hospital in hopes of being tested. Mothers felt for Esquivel, with locals Berta, Gloria and Roberta offering to donate. Mark of Apple Valley was drawn to the donation through his own son, also named Ayden. Others such as Karen couldn’t donate, but wanted to offer their prayers and words of support to the family. While the hospital processed the flood of requests, Esquivel’s mother continued reaching out to agencies that could help her daughter be allowed to donate. She finally reached America’s Health Insurance Plans and was then contacted by the chief of the Children’s Medical Association. He told Esquivel that they’d approved her to be tested as a donor, and if the physicians agreed that she was a match, then they would approve the transplant. Then another family’s tragedy became Ayden’s salvation, as a deceased donor was found to be a match Saturday night. The family rushed to the hospital to sign the consent forms, and the surgeon scheduled Ayden’s transplant for Sunday at noon. Ayden then took a turn for the worse, joining a statistic estimating that 14 people die each day in America waiting for a life-saving organ transplant, according to a 2006 publication by the Bioethics Department at Iowa State University. Ayden’s services will be on Friday at 3 p.m. at Forest Lawn in Cypress. Works has also set up an account at Washington Mutual for anyone who wants to help offset funeral expenses, under account number 3172369198. So, Ayden got his wings on Sunday. Why? Because of a Medicare law. Granted, I understand why we have this legislation in place, but shouldn't there be a parents consent form, or parental clause that allows a minor parent of a child on the waiting list to give a live donation? My heart goes out to Ayden's family. You are all in my prayers and I am so sorry to hear of your loss! I'd also like to recognize the amazing people who stepped forward to be tested as a live donor and to the family of the other small child who was recently lost. Your actions speak louder than words. Simply put, the NCCUSL wants to make the regulations of organ and tissue donation universal from state to state. This will potentially make the process easier and more uniform for the registries and procurement processes. 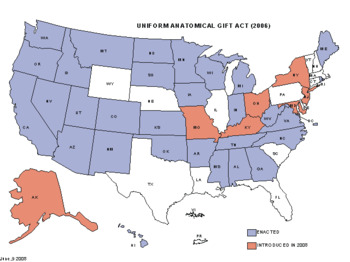 There are more than 25 states which currently have the (UAGA) enacted. (These states are noted in Blue--the states noted are in Red are in the process of passing the bill). Of those states who have approved is Iowa and Wisconsin. In my research I came across some AMAZING numbers from Wisconsin! Last Friday, August 1st Governor Jim Doyle proclaimed that 45,000 citizens of WI joined the orange "donor dot" program in the last since months. 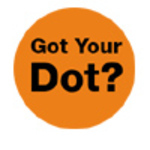 Basically what the "donor dot" program is, when you decide to become an organ donor and register the DMV will send you an orange dot to place on your drivers license. "Wisconsin's leadership in organ donation continues to ensure a better life for hundreds of families across the state," Governor Doyle said. "I want to thank the thousands of Wisconsin citizens who have talked to their loved ones and made an organ donation pledge. As the need for organ donations rises, we must continue to raise awareness for this critical cause, and express our profound gratitude to the families who support their loved one's wish to give the gift of life." In 2007, there were 225 organ donors in Wisconsin, resulting in almost 600 transplants. Today, Governor Doyle recognized these donors and presented a Governor's Gift of Life Medal to each family whose departed loved ones donated their organs last year. The need for organ donation is growing, and 1,436 patients in Wisconsin are currently on waiting lists for organs, including 28 children. Nearly 60 percent of these patients have been waiting more than one year. Wisconsin continues to lead the nation in many areas of organ donation. In addition to the 45,000 new orange "donor dot" participants, over 50 percent of Wisconsin residents have expressed their intent to donate. Governor Doyle urged the importance of organ and tissue donation and commended the work of the Wisconsin Donor Network and the OPOs of WI for their hard work and being recognized as a leader in the nationU.S. Department of Health and Human Service Organ Transplantation Breakthrough Collaborative for excellence in all performance areas. Way to go Wisconsin!!! Keep up the great work. You are definitely making a huge difference in the lives of many Wisconsin residents, and even those in surrounding states!